see what your music interests. This is speculation on my part but it wouldn’t surprised me given how intertwined all of the Microsoft services are these days. Regardless, Cortana has grown exceptionally since it was released as part of the Lumia Cyan update and that growth is likely to continue given the heavy integration of Cortana in Windows 10 on all devices. Finally, what is unclear about this update and some of the ones we have seen over the past few weeks is if they are global. For example, on my Lumia 635 which is a US based phone on AT&T, I have these new features along with the new Lifestyle features that came out a few weeks ago. These new features allow you to track your fitness, get gym notifications and the like. However, on my Lumia 1320 which is an International version I picked up while I lived in the UK, I do not have the Lifestyle features. 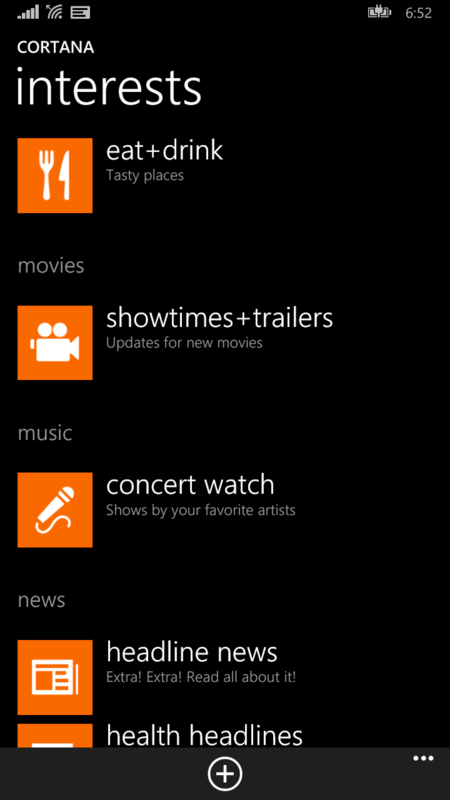 If you live outside the US then it certainly worth a look as what is available in Cortana for you may vary.